On the Barotse Floodplain in western Zambia, men are often seen fishing while women process and sell fish. This division of labour comes from deeply rooted perceptions about gender roles. Men fish, travelling to deeper waters farther from their homes, because of the perception that only men have the strength required to paddle canoes and set and pull nets. Women tend to participate in post-harvest activities, given their socially assigned roles as caretakers of their homes and their lack of transport, which prevents them from travelling long distances to fish or trade fish in bigger towns. These patterns are typical in Zambia and elsewhere in Africa’s small-scale fisheries. Gender relations that shape opportunities for women and men also shape how people benefit from small-scale fisheries, depending on their gender roles. African fisheries end up with a lot of fish loss and waste, partly because of the methods and technologies processors use. But another reason is strong gender norms and power relations: women who are processors cannot dedicate the necessary time it takes to smoke or sun-dry the fish. As they need to hurry to fulfil unpaid or household duties, women try to speed up the processing and often burn the fish when smoking it. Or they over-dry the fish when using open-air sun-drying methods because other duties take priority and they are unable to bring the fish in on time. Men who engage in processing do not need to perform such household duties and are able to focus more on processing fish, and so lose less fish to waste. A research project carried out by WorldFish and partners found that among fish processors in the Barotse Floodplain fishery, women lost three times as much fish as men.1 1. Cole, S. M., C. McDougall, A. M. Kaminski, A. S. Kefi, A. Chilala, and G. Chisule. 2018. Postharvest fish losses and unequal gender relations: drivers of the social-ecological trap in the Barotse Floodplain fishery, Zambia. Ecology and Society 23(2):18. DOI: 10.5751/ES-09950-230218 See all references This loss refers to fish that is sold at a reduced price or destroyed, and considered waste. This and other research implemented by the project made a strong case for considering the areas of opportunity to improve the technologies people use in small-scale fisheries to increase their livelihood security, but also the “social” opportunities to improve gender relations for longer-lasting development outcomes. This sparked a participatory action research initiative with fish processors that was implemented to develop and test improved post-harvest fish-processing technologies, especially aimed at women using the methods.1-2 1. Cole, S. M., C. McDougall, A. M. Kaminski, A. S. Kefi, A. Chilala, and G. Chisule. 2018. Postharvest fish losses and unequal gender relations: drivers of the social-ecological trap in the Barotse Floodplain fishery, Zambia. Ecology and Society 23(2):18. DOI: 10.5751/ES-09950-230218 2. Apgar, J. M., P. J. Cohen, B. D. Ratner, S. De Silva, M.-C. Buisson, C. Longley, R. Bastakoti, and E. Mapedza. 2017. Identifying opportunities to improve governance of aquatic agricultural systems through participatory action research. Ecology and Society 22(1):9. DOI: 10.5751/ES-08929-220109 See all references For example, the project experimented with solar tent dryers, salting, and smoking kilns. 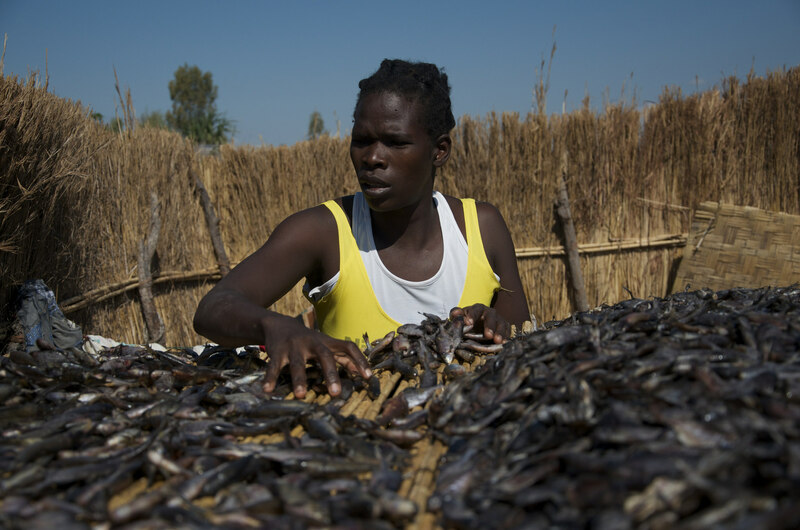 A woman turns her fish as they dry on reed racks in Liyoyelo fishing camp, Mongu district, Western Province, Zambia. Photo by Olek Kaminski, 2016. Prototypes of the improved technologies were showcased to women and men processors who then formed groups to construct and modify the technologies to fit their needs and context. Efficiency and loss-reduction gains were made by processors through their use of the improved technologies, which has helped them to increase their incomes. With less time and labour spent on processing fish, especially with salting, women have more time to engage in other activities. The research project also piloted communication for social change. Informal drama sketches were designed to highlight the gender norms and power relations that especially limit women from engaging in and benefiting from various value-chain activities – including processing using the improved technologies. The sketches were performed over a three-month period. After the pilot was completed, surveys showed that men’s attitudes changed significantly from before and after seeing the drama sketches, shifting towards more gender-equitable outlooks. Most notably, after the sketches were performed, women had increased financial decision-making powers about the income generated from processing fish. And post-harvest losses among processors – both women and men – were reduced with the use of the improved technologies, and especially the salting method. Read more about WorldFish efforts to make that shift in the stories in this “Small fry” series. 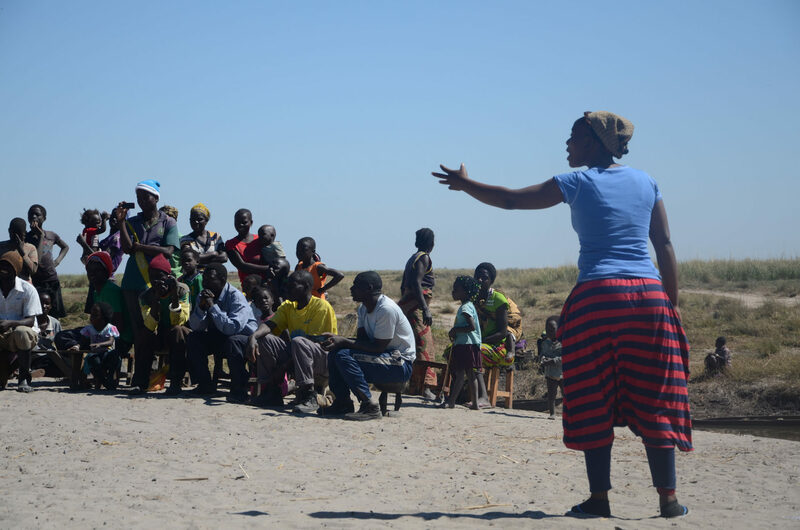 Opening image: A woman performs a drama on improving gender relations in Mukakani fishing camp, Mongu district, Western Province, Zambia. Photo by Olek Kaminski, WorldFish, 2016.